'Roopkatha' is an upcoming tv serial on Colors Bangla. 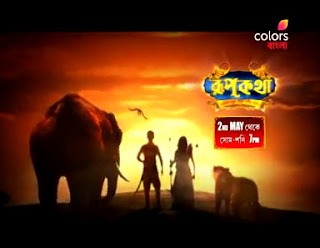 New tv serial is set to air on Colors Bangla from 2 May onwards, every Monday to Saturday, at 7.00 pm.The show will replace Nagleela. The show will narrate the story of Bhumi, princess of Rupnagar who grew up in the jungle instead of the palace and her sole aim in life will be to reclaim the throne from Mohini by using powers of positivity and goodness. However, Mohini is now blessed by the powers of Darkness and is almost invincible. For Bhumi to acquire these powers of positivity and goodness, she must make an adventurous yet perilous journey across seven seas and thirteen rivers. After she overthrows Mohini she will also carry out the final rites of her parents who were brutally murdered by Mohini.